Combining colors is no easy task for me, but given the above i thought i might give it a try :) My first time joining in this challenge too. 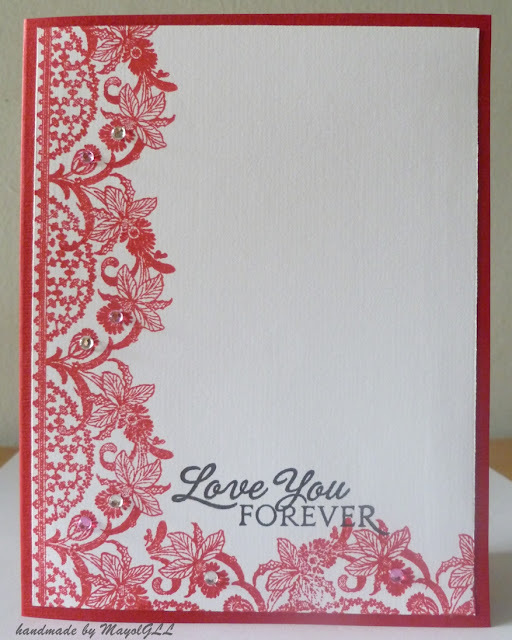 Supplies: Cardstock - Bazzill, AC; stamps - Flourishes "Lace Edges," Papertrey Ink "Heart Prints;" ink - PTI Pure Poppy, Versafine Onyx Black; bling - Doodlebug Designs Inc.; adhesive - Helmar. Thanks for staying a while! Nice card. I saw it on the JUGS Challenge. 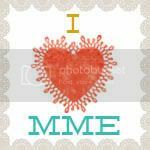 Reminds me that I have a lace stamp I have never used. Time to get it out. Your first time joining and your card is absolutely beautiful...love the feminine stamping and the touch of gems! Gorgeous! Thanks so much for playing along with us at Just Us Girls! Gorgeous card. That image is just lovely. I like how you used it around the edges. Just enough bling too! Gorgeous! I love the rich design plus bling! Thank you for playing with Just Us Girls!